The Walton County Water and Sewer Authority is waiting on a response from the Georgia Environmental Protection Division to the Authority’s application for renewal of its permits to draw water from the existing Hard Labor Creek Regional Reservoir as well as from the Apalachee River. The Authority submitted its renewal request for the two permits on May 3, but, according to Jimmy Parker from Precision Planning Inc., who represents the Authority, the Georgia EPD is holding up action until the Authority acquires land for an intake facility on the Apalachee River. Parker said he and others representing the Authority have had “multiple conference calls” with the EPD since submitting the application but no written correspondence. The Authority’s request from the United States Army Corps of Engineers for an extension of the Authority’s permit to withdraw water from the Apalachee River also is on hold while the Authority purchases land for the intake facility. Parker said the purchase and sales agreement with an unidentified landowner currently is being finalized and he anticipates a called meeting of the Authority and the Hard Labor Creek Regional Reservoir Management Board in early to mid August to approve the agreement. 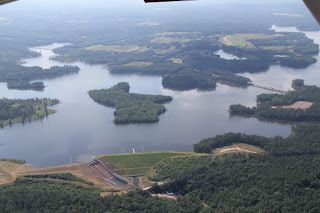 Oconee County is a partner with Walton County on the Reservoir, though the state and federal permits are held by the Walton County Water and Sewer Authority. The EPD notified the Walton County Water and Sewer Authority on Jan. 19 of this year that its permit to withdraw water from the Hard Labor Creek basin would expire on June 13, 2018. The letter did not ask for action on the permit for the Apalachee River. The May 3 renewal application submitted by Parker, who is project manager for the Hard Labor Creek Regional Reservoir, listed both the permit for withdrawal from Hard Labor Creek and the permit to withdraw from the Apalachee River. Water from the Apalachee River is to be pumped to the existing Hard Labor Creek Regional Reservoir to increase its capacity at some point in the future. The reservoir, located northeast of Social Circle, currently it at or just below full stage. The Authority has asked the United States Army Corps of Engineers to extend beyond its expiration next year the permit to build an intake facility on the Apalachee River. The Authority had been considering an intake facility in Morgan County instead of the Walton County site listed in the original permit from the Corps, but the Authority informed the Corps in June that it was moving the intake to an as-yet-unspecified Walton County location. The reservoir and Apalachee River intake facility are “essential to meeting the long term water demands for Walton County, Oconee County and the Northeast Georgia Region,” Parker writes. The renewal application projects that the population of Walton County will grow from its 2018 level of 94,311 to 220,175 in 2068. The population of Oconee County is projected to grow from 37,196 today to 81,217 in 50 years, or in 2068, according to the application. The reservoir, without the intake facility, is capable of producing 13.3 million gallons per day of treated water (calculated as average annual daily use), according to the document. With the Apalachee River intake facility, the reservoir is able to produce 41.1 million gallons per day of treated water (again, calculated as average annual daily use), according to the EPD renewal application. Oconee County’s share of water is set at 28.8 percent. At present, according to the application, the annual average daily use of water by the Walton County Water and Sewer Authority is 4.8 million gallons per day, and the annual average daily use in Oconee County is 2.6 million gallons per day. The Authority is not the only water supplier in Walton County, and, in fact, it is supplying water to only about a third of the population at present. Monroe is a competing water supplier. The application projects that the Authority will need water from the reservoir as early as 2023 to serve its customers. In 2068, the report states, the Authority will need an additional 29.6 million gallons per day. Oconee County is the only water supplier in the county, but about 40 percent of the population gets water from its own sources, most commonly from wells. The application also projects that Oconee County will need water from the Hard Labor Creek Regional Reservoir by 2023, though Oconee County water officials have disputed that. The renewal application states that Oconee County will need 5.7 million gallons per day from the Hard Labor Creek Regional Reservoir in 2068. Water withdrawn from Hard Labor Creek will be treated at an as yet unbuilt treatment facility near the dam just northeast of Social Circle. A distribution system will be built to pump that water to Walton and Oconee counties “and customers served by nearby utilities via distribution system interconnections,” according to the renewal application. Hard Labor Creek and the Apalachee River are part of the Oconee River Basin, and inter-basin transfer from the Oconee River Basin will occur as approximately 50 percent of the Walton County Water and Sewer Authority’s service area is within the Ocmulgee River Basin, according to the application. An estimated 70 percent of the service area's population is expected to live within the Ocmulgee River Basin, according to the application, while all of Oconee County’s service area is within the Oconee River Basin. The overall inter-basin transfer is estimated at 50 percent, according to the application. Parker provided me with the renewal application as well as the aerial photo used above. The initial purpose of this huge project was to facilitate a future water source. Watching the dysfunction in how it has careened into a befuddlement has been a hoot. A few folks have gotten wealthy with insider information, of course, as lakefront lots go for a pretty penny. It will be finished sometime, somehow, with water, recreation, fishing, and homes built. There is no telling at this point when that will be. You many want to check, but Walton County originally owned 25% of Varner Lake, the reservoir in Newton County. They paid for 25% of the cost and were entitled to 25% of the water. I haven't heard that arrangement has changed.